My work this week, is researching the constructed/farmed image. Or should I say the re-constructed image. I am using images made this module and constructing novel ones using the elements of experimentation and chance. I deconstruct the prints, by leaving them out side to the elements, then bringing them back inside and into the printing process by scanning and manipulating them in Lightroom and Photoshop then adding elements of the fence, paint, pencil and water color on the print to make my images. 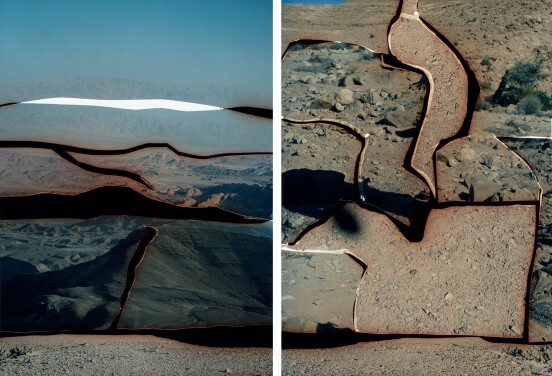 Researching other practitioners who also work in image construction through a de-constructing and re-construction method is the work of Dafna Talmage 1 Dafna constructs landscapes. The method she uses is cutting up film negatives and making collages of landscapes by printing a ‘stitched together’ negative consisting of many negatives. She makes type c prints of her work, and is exhibited and collected. I find it interesting that she destroys the negative and reconstructs it from the destructed images. I am doing this with my prints but will look into manipulating/deconstructing/constructing the negative my self and incorporating this ideas into my printing process. It is amazing how these elements are coming together as a cohesive whole, and a lot of the time, the images come out in ways never imagined. This is what I mean by the ‘chance’ part of the image making process I am using, comes into play. Using all the technical, creative, and accidental skills I have acquired over the decades is filled in my memory and I am incorporating this into my work as well. It seems that the materiality of my images is starting to emerge. Painters use paint, sculptors stone, carpenters wood and from this material, they create their works of art. I have always found photography a little deficient in this arena, it’s materiality is limited to a piece of paper, on which an image in printed. Hence the argument of photography as a form of art. Henri Gaudier-Brzeska a sculptor working in France about the same time as Constantin Brancusi said that the beauty of sculpture is inseparable from its material. 2 He recognized the value of materials, as part of the art making process. It is for this reason that I have become very attracted to the construction method of making photographs, because there is materiality added to the work by the artist, instead of just recording reality as the materiality in front of the lens. Ansel Adams did the majority of his work in the darkroom with a lot of image manipulation and construction. His images were built up from the negative and done through various means. This included chemical manipulation (The Zone System) 3 superimposition, dodging, burning and cropping. A quote from him alludes indirectly to this as a double entendre: “Twelve significant photographs in any one year is a good crop.” – Ansel Adams. 4 Cropping here has two meanings, as in harvesting, but he could also be mean ‘cropping’ (cutting out, excluding) which takes place in the dark room. Working in the dark room, or in my case Light-room, the digital age equivalent, has finally started to pay off. I am not working in the darkroom as yet, but looking at more of the post process in constructing the image. In photoshop do my layering and in Lightroom, most of the color correction, cropping, density correction adding or removing sharpness etc. Even though Ansel did not do much abstract work, he worked a lot in the darkroom. I have finally learned how important post production in the image making process is. Ansel is one of the few photographers who does his own printing, most photographers even contemporary ones send in the images for printing. At my stage of the image construction process, I put the entire image together, then scan or rephotograph it, all the elements of the image construction are made by me. With the color work, I will have to send it out, but will have my work done at labs like Weldon Color Lab 5 in Santa Monica. They are able to make chromogenic type C-prints in color. Using photographic paper which is processed in chemicals. The have a digital enlarger that can project a digital image onto photographic paper called the Lite-Jet. I have had prints made my this print head before and the results are absolutely stunning, the fact the the image is printed onto analogue color paper makes the system of great interest to me. I still feel the analogue print, whether Type-C chromogenic or fibre based black and white paper is still more valued by the collector and the galleries, even though ink-jet printing is extremely good and archival, I will still have my images made on the Light-Jet and on analogue paper as long as it is available. I did some research on the prices and the services offered at Weldon, as it may be the lab I will use to make images for my FMP, if some of images are in black and white, which they may be, I will print them myself at my home dark room on fibre-based analogue paper. Experimentation is an important part of abstract photography. Fox Talbot was a great experimenter in his day and tested all types of chemical combinations to find a more light sensitive surface on which to record the image. When he was first doing experiments using sodium nitrate, he discovered by accident, that the less sodium he used in the sensitizing process, the more sensitive the surface became. This was discovered by accident, when he noticed that the paper not evenly coated with the saline solution was more sensitive to light. When he was searching how to sensitive paper to light, he experienced to see how he could make it more sensitive. By accident, he discovered that if he added less salt to the dipping solution, it affected the sensitivity of the paper. Next Next post: Week-10-Contextual Research.